DP president Norbert Mao was by press time under police detention. File photo. 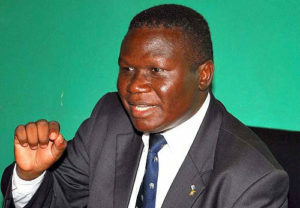 KAMPALA–Police have arrested the Democratic Party president, Norbert Mao and six others over a planned match to Parliament in protest of the age limit debate. Kampala Metropolitan acting police spokesman, Luke Owoyesigyire, confirmed that seven people including Mao, were being held at the Central Police Station (CPS) in Kampala. Mr Owoyesigyire said he was yet to get the particulars of the other people arrested alongside Mao. Addressing journalists shortly before the arrest, the DP leader had urged Speaker Rebecca Kadaga to be fair and throw out the presidential age limit bill whose report by the Legal and Parliamentary Affairs Committee was expected to be tabled in Parliament today (Tuesday, December 12). “We say to Speaker Kadaga today, ‘you have a chance to redeem your tattered image. Do not be soft like a sausage,” Mao said. The age limit bill being championed by Igara West MP Raphael Magyezi seeks to scrap presidential age limits for persons aspiring for the Presidency of the country. Currently, a person is not legible to aspire for the highest office on the land of they are below 35 and above 75 years. This means President Yoweri Museveni will not be able to contest for the presidency in 2021 if the Constitution is not amended.